With the advent of summer comes the time for more active recreating in and around Montana’s abundunt fresh water resources. Harmful algae blooms can occur in any standing body of water that is exposed to the sun. Some years, under certain conditions, the algal blooms may produce toxins which pose a health threat to animals and people. 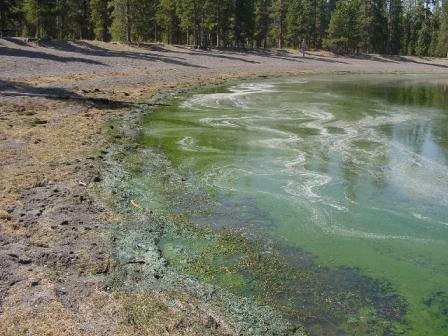 The algae responsible for algal blooms occur naturally and during spells of warm weather can multiply sufficiently to color the lake water so that it appears green, blue-green or greenish-brown. During calm weather, the algae can rise to the surface to form a scum which may look like blue-green paint, or jelly, and may form flocs or mats on the lake surface. The Gallatin City-County Health Department recommends that the public avoid swimming in waters containing a green, floating scum of algae. We also recommend that you do not allow domestic animals (livestock and pets) to drink water containing this green algal scum. 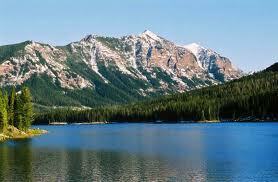 In Gallatin County, harmful algal blooms have occurred in the past at Hebgen Lake. Deaths of domestic animals have been attributed to ingestion of water during those harmful algal blooms. Hebgan Lake is routinely monitored to detect the presence of any harmful algal blooms. An infection in the intestines caused by a parasite, it can be contracted by drinking out of streams or water systems that are not treated. It is often found in tap water in undeveloped countries. Treatment: If you think you may have Giardia, contact your healthcare provider for testing and treatment. Avoid water (drinking and recreational) that may be contaminated. Do not swallow water while swimming in pools, hot tubs, fountains, lakes, rivers, springs, ponds, streams, or the ocean. Do not drink water or ice made from water during community outbreaks caused by contaminated drinking water. Do not use or drink poorly treated water or use ice when traveling in countries where the water supply might be unsafe. Disinfect tap water by heating it to a rolling boil and letting it boil for 1 minute. Use a filter that has been tested and rated by National Safety Foundation (NSF) Standard 53 or NSF Standard 58 for cyst and oocyst reduction; filtered tap water will need additional treatment to kill or weaken bacteria and viruses. Treatment: Most people recover without treatment within five to seven days. The consumption of extra fluids is encouraged to prevent dehydration. Avoiding swallowing water when swimming or playing in lakes, ponds, streams, swimming pools, and backyard “kiddie” pools. Cryptosporidium is one of the leading causes of waterborne disease, or disease caused by contaminated drinking water or recreational water. Recreational water is water from swimming pools, hot tubs, fountains, lakes, rivers, springs, ponds, or streams that can be contaminated with sewage or feces from humans or animals. Below are answers to the most common questions regarding Cryptosporidium and healthy swimming. –From the CDC website.